It is good practice to keep a backup copy of key business data. Basis practice is to take a backup of key organisational data regularly on a medium that can be stored offsite if necessary. Arguably, in a cloud computer environment a backup is not needed, but many organisations still (and probably always will) maintain some data internally. 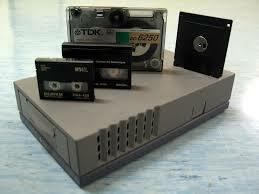 One quite old method of storing a backup copy of data – or even storing data – is on magnetic tape. As recently noted in the Economist, this backup medium has gained a new lease of life. Cloud storage has become so cheap and fast, that the tape could have been seen as redundant. But one thing a magnetic tape has is portability – it can thus be easily secured anywhere, away from normal business risks or even hackers. As noted in the Economist article, many organisations also now generate huge volumes of data (i.e. big data) which may be useful for analysis. Tapes can easily store such data. 4- they can be repaired (spliced). There are also likely to be improvements in tape technology in coming years as their value for storing large amounts of data has come back into vogue. By martinjquinn in Ch 2 - basic terminology and concepts, Ch 6 - integrating information systems on April 15, 2014 .